MILFORD, Mass. – Over halfway through the third quarter, Stoughton had a comfortable 30-7 lead and an offense that had moved the ball nearly at will. But less than six minutes later, Milford had found the end zone twice and pulled within one score. Trailing 30-22 less than a minute into the fourth quarter, the Scarlet Hawks suddenly had almost of the momentum and forced Stoughton into a fourth down situation for the first time all game. The Black Knights kept the offense on the field from the Milford 31 and senior Jake Gibb delivered a 13 yard strike to junior Ryan Sullivan for a first down. Three plays later, Gibb hit senior Steven Elice in the endzone for a 16 yard touchdown. 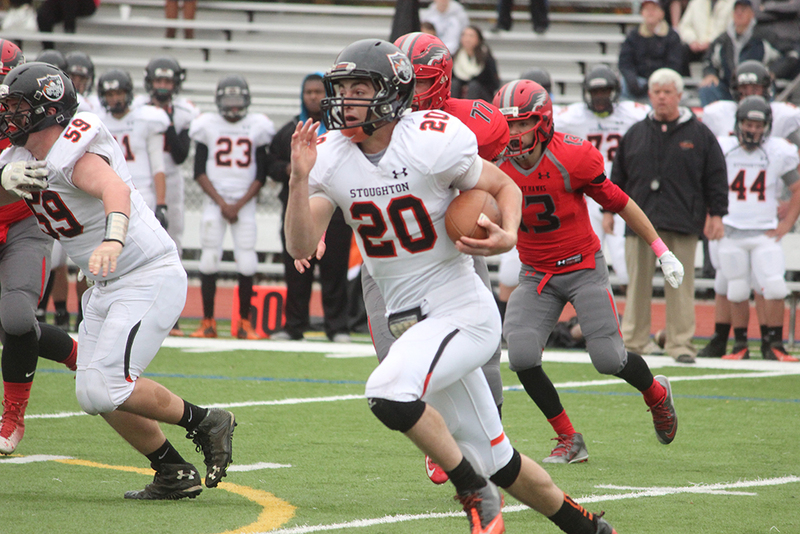 A two point conversion from Sullivan recreated the cushion and the Black Knights emerged with a 38-22 win. The win earned Stoughton a share of the Hockomock League Davenport Division title, the second straight year that the Black Knights had won a league title. It’s the first time in program history at Stoughton has won back-to-back league titles. With a 24-7 lead at halftime, Stoughton took the opening kickoff and marched 75 yards on nine plays, capped off with a five yard rush from senior Guy Eddy to make it 30-7. But there was no quit in the Scarlet Hawks. Milford responded with a 11 play, 56 yard drive to find the end zone. Milford senior quarterback Zach Lanzetta worked the offense down the field, highlighted by an 18 yard reception from Jack Cappelletti, an 11 yard reception from Asong Aminmentse and a 12 yard catch from Ryan Nesta. Lanzetta then his Shapel Feaster for a four yard score to make it 30-14 with 1:38 left in the third quarter. On the ensuing kickoff, Milford’s Sean Lehane hit a dribbler straight down the middle and Dan Cossette was able to fall onto it to get the ball back for the Scarlet Hawks. Milford quickly moved up the field as Lanzetta hit Cappalletti for 16 yards and Jack DeSantis (16 carries, 78 yards) ran up the middle for 11 more. Facing third and 2, Lanzetta used the QB keeper for a gain of nine and on the next play, Lanzetta connected with Cappalletti, who was able to haul in the pass with one hand for a seven yard score. Blake Hill plowed into the end zone for the two point conversion to bring Milford within eight at 30-22 with 10:39 left. Stoughton moved up the field to the 29 but a tackle for a loss from Feaster and then a pass break up from DeSantis and Feaster put Stoughton into fourth and long. That’s when Gibb hit Sullivan. Gibb finished 8/11 for 173 yards with the one touchdown pass while Sullivan had 95 yards on the ground on 14 carries with a pair of touchdowns and then 84 yards through the air on three receptions. Stoughton amassed for 456 total yards, with 283 coming on the ground. Lanzetta was 19/34 for 154 yards with a pair of touchdowns for the Scarlet Hawks. After Milford was forced to punt on their opening series, Lehane pinned Stoughton inside the five at their own three yard line. The field position didn’t phase the Black Knights as they took just eight plays to move the ball field. All eight plays were rushing plays and the last was a 44 yard burst up the right side from Christian Hill for a touchdown. Milford responded immediately, going 13 plays to move the ball 56 yards. DeSantis had a big run to convert a third down and then hauled in a 14 yard pass from Lanzetta for another first. From one yard out, Hill punched it in and Lehane’s extra point gave the Scarlet Hawks a 7-6 lead with 10:17 left in the second quarter. It took Stoughton less than a minute to get the lead right back though. Sullivan had a big kick return that set the Black Knights up at the Milford 22 yard line. Three plays later, Sullivan dove in from two yards out to make it 12-7. Just three plays into MIlford’s next series, Stoughton linebacker Harry Kimball read the screen play perfectly and intercept Lanzetta to give the Black Knights the ball at the Milford 25 yard line. Seven plays later, Sullivan went up the middle for a five yard score to make it 20-7. Another Milford punt gave Stoughton the ball and Gibb moved it up the field quickly. He hit Elice for 32 yards over the middle and two plays later, Izon Swain-Price (10 carries, 80 yards) took the toss to the left side and raced up the field for a 30 yard score to make it 24-7 with 2:23 left in the half. Stoughton nearly scored right before the half as Gibb hit Sullivan for 43 yards but he was tackled by Nesta on the two yard line as time expired in the first half. After losing the first two games of the season Stoughton has bounced back nicely and will likely be the 5th seed in D3 Southwest. Those two first opponents for Stoughton just happened to be Marshfield (7-0), who is widely regarded as the top team in the state, and North Attleboro (7-0), who won the Hockomock League Kelley-Rex and will likely be the second seed in the D3 Southwest. “That was huge for us to take on two great teams,” Burke said. “People questioned why we played Marshfield but we’ll play anyone, we didn’t want to sit out for a week. We’ll play. Sometimes you want to milk your schedule but we learned a lot and I think we did as well as anyone against Marshfield. We got points from Marshfield and North because they won every week. I’d do it again too. Stoughton (4-1, 4-3) will likely travel to #4 Walpole in the first round of the playoffs. We will have the playoff seeds posted as soon as they are announced. 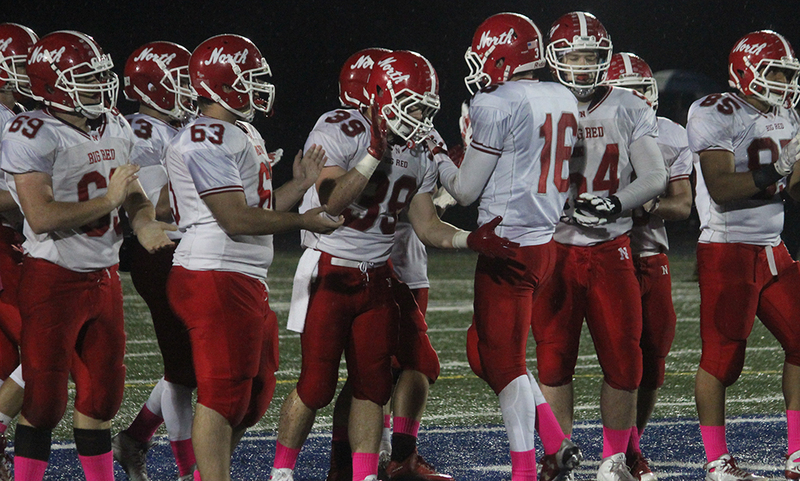 Milford (2-3, 3-4) looks to have just missed the playoffs, less than .2 points behind Norwood. The Scarlet Hawks will be back in action next week against an opponent to be determined.